Hair bands collect dirt and germs. They may cause rashes and infections on the skin. Avoid wearing hairbands on your wrists. 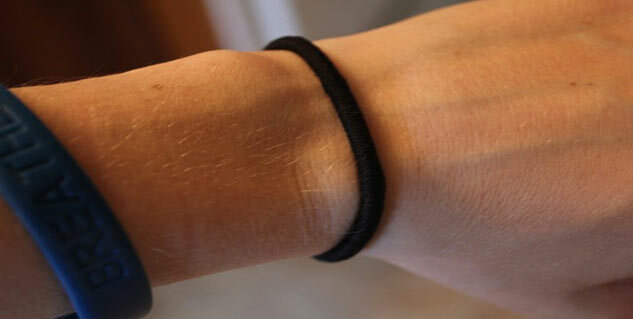 Do you adorn your wrists with hair bands, allowing them to pull back your hair in a flash? Think again if you have been making the mistake of wearing hairbands on your wrist to bed, the gym, and work. A simple suggestion is to stop it before it is too late to regret because experts say that wearing a hairband on your wrist frequently is not as safe as it may look. As per experts, wearing hairband on your wrist may develop painful bumps on your arm. Besides, hairbands have rough edges that keep rubbing against your skin, causing an abrasion, which may then allow bacteria into your body. However, following the below given tips will allow you to wear hairbands safely. Avoid using things that compress or put pressure on your skin, restricting flow of blood to the hands and fingers, causing a vascular problems and skin breakdown. Make sure whatever you wear on your hand, be it your watch, jewellery or any other accessory, is not clinging tightly onto your skin. The best way to check this is to stick a finger under it. Glitter may add sparkle to your ponytail, but when you wear it around your writs, it can rub against the skin causing tiny cuts. These cuts make it easier for skin bacteria, which is normally harmless, to enter the body and possibly cause infection. So, it is better that you completely avoid wearing glittery hairbands on your wrists. Whenever you wash your hands, you must know that it is equally important to clean the skin area under the hairband. This way you will be able to prevent bacteria from flourishing and causing infection. Unlike changing socks and underwear daily, only a few people consider swapping out the old mangy hairband for a new one. Don't forget that your hairbands collect dirt and bacteria too. So, it is wise to wear clean ones and throw away the old one every now and then.